Do you want to command the elements? Move with the wind? Call animal spirits to your side to aid you in shootouts and command the spirits to take over Gomorra? Then the Eagle Wardens is the faction for you. We stand guard against the evil in the world that men do not see, with powerful totems, the strength of our ancestors, and the wisdom of the crow! Eh, owl I mean! 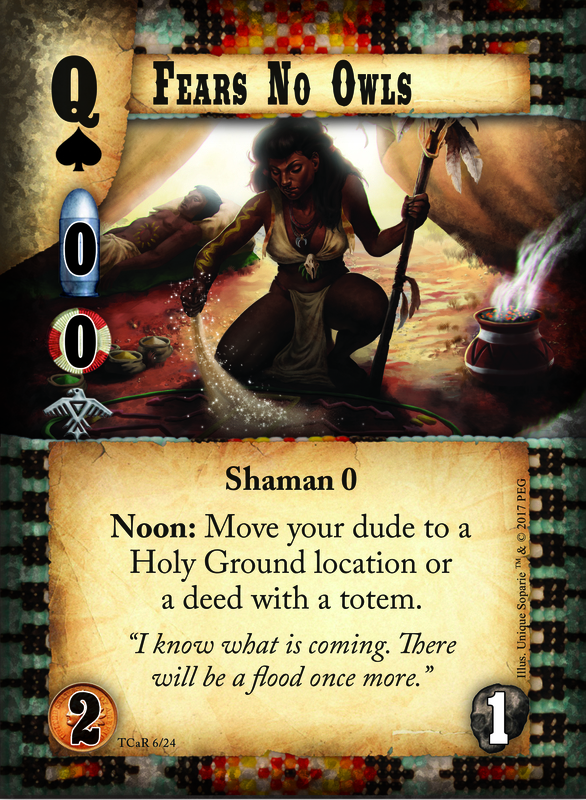 Eagle Wardens have some great studs with influence, powerful shootout spirits, and board control totems. Add in a variety of movement tricks that will leave your opponent dazed and confused. 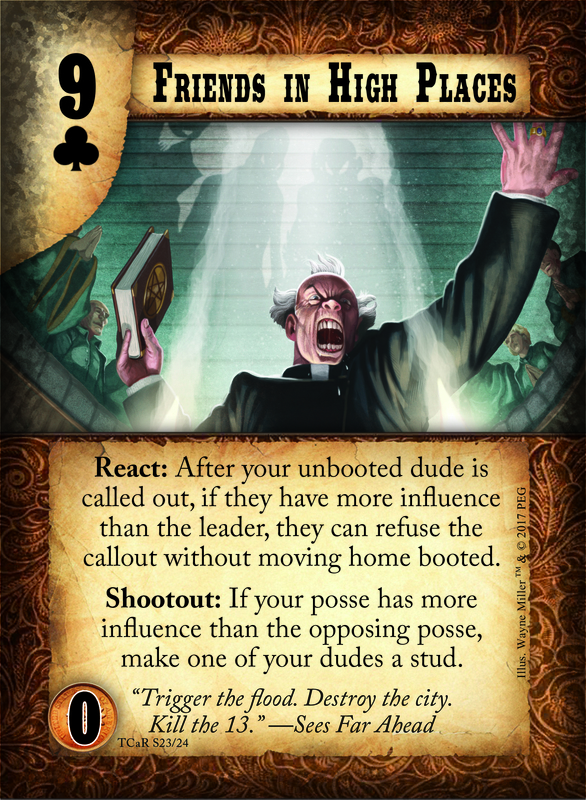 Top this off with some great homes that will support you in card draw, influence, and let you use your spirits again and you have a rock solid faction with plenty of tricks up their sleeves. Out of the tent flap, the initial Eagle Wardens home favored card draw and town square control. Of course, whenever the town square is involved, conflict is involved! As it happens, our merry band has a plethora of available support for fighting the good fight. First of all we have Spirits, divided into totems and regular spirits. The former requires a shaman to attach the totem deed you control. 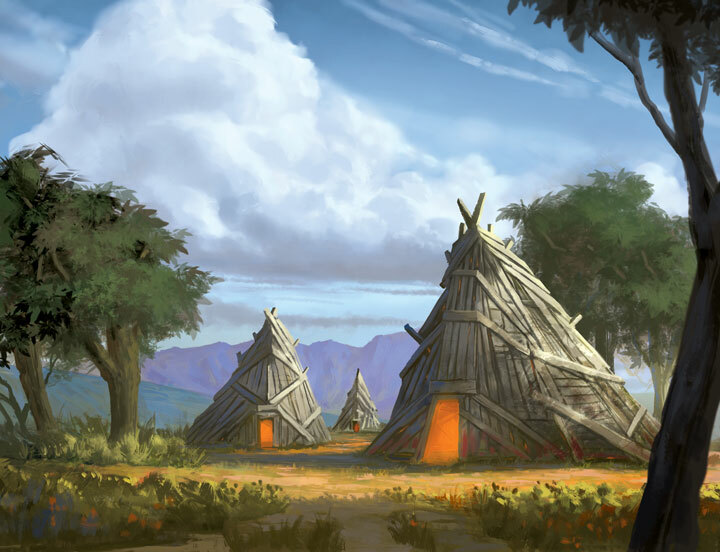 Totems generally only target that deed or adjacent locations. Spirits attach to the shaman, and act like any other spell in terms of costs, pulls, and printed requirements. Calling our ancestral spirits and totem animals not only gives extra stud bonuses, but it also allows sops casualties without losing any actual dudes. The fearsome Mother Bears Rage protects our deeds from hostile takeover or the home itself if someone wanders over to our side of the street. Also use to aggressively bully dudes at an opponent’s deeds if needed. Even better, our shaman Kabeda can use the bear’s rage all over town! On the other hand, Spirit Dance, while costly, combos well with Point Blank or No Turning Back. I can see that you want something a bit more harrowing than that! How about a posse of immortal spirit warriors fighting at your command? For that we have to awaken the Pack. Harrowed spirits do a great job of covering casualties, should we have an unlucky draw hand (or cheat and be punished for it). Remember that this totem works for any other spirits we might call as well. However, not all our shamans rely on spirits to fight their fights for them! The meekest of shamans can become the fiercest of fighters with a spirit like Strength of the Ancestors. Turtle’s Guard gives our shaman extra protection – but sometimes we do not even need to take the fight. What if we just need that shootout action in our hand or a cheatin’ resolution or perhaps just want to filter out those off-value cards? The powerful Sun-Touched Raven comes to our aid. This spirit creates the perfect setup in any shootout while at the same time being a sidekick, thus enabling us to discard it to cover a casualty. Talking about sidekicks, this is something of an Eagle Warden specialty. Several of our dudes interact with sidekicks such as the Mountain Lion or the Spirit Horse. Plus some of our dudes have the ability to pull out sidekicks on demand Requiem for A Good Boy not only covers casualties, but also sets up Point Blank by unbooting your stud. You also get to send another dude home. Pro tip, banish notorious sops such as Brute or Willa Mae, so your posse can inflict casualties upon influential or dangerous dudes. Kollatt created a deck that uses many of these tricks. Running values 3-4-6, it uses the outfit’s ability to ace off value cards and thin out the deck until you can expect to draw 4 of a kind regularly. Other versions of this great deck have substituted 10s for the 6s or tried to get a grifter into the starting posse. Not only do we master spirits and sidekicks, we also move around town as we please. Spirit Trail and Ghostly Communion get us to and from our opponent’s deeds. Seize control over these deeds with our ancestor’s spirits and limiting others with the Red Horses Tail. Gateway to Beyond supports shamans such as Mazatl, Mick Aduladi, and Sarah Meoquanee who have built-in movement actions for getting to and from deeds and shootouts. Movement, isn’t enough however. Sometimes we need to control the shootouts and bring the Double Barreled, along with Mariel Lewis. For a fun trick, kidnap a hapless soul that moved out of town, and if he puts up a fight use Mariel’s action to send him home – immediately winning the shootout. Eagle Wardens tends to have expensive but powerful dudes. Chief Stephen Seven-Eagles is the embodiment of that statement. As a late game finisher, he is cheap to get into play if you have placed your totems around town and can literally finish the game if he is allowed to get to the town square. While a draw bullet, you can remedy this by calling upon the spirits or equipping him with a good ol’ pearl-handled. Speaking of the Chief, have a look at this deck by Whizzwang. 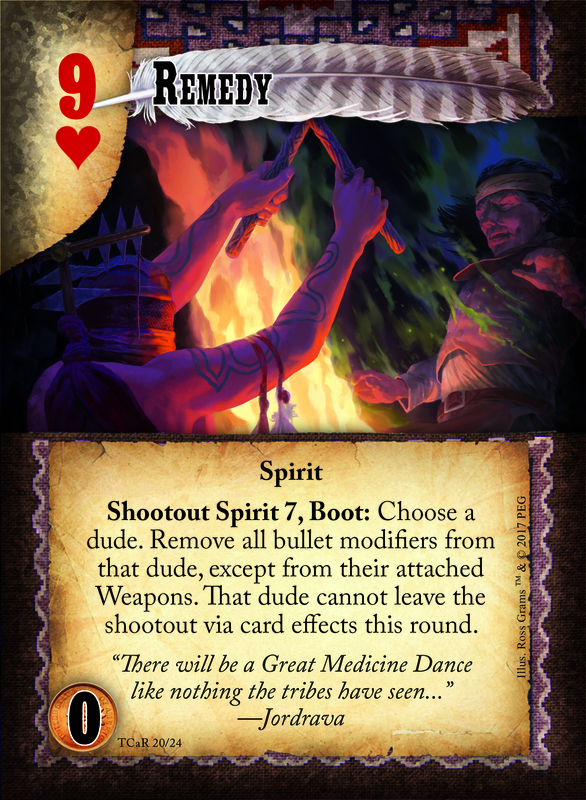 By unbooting and clever movement, Chief Stephen can rack up a staggering amount of Control Points that forces your opponent into an all-out shootout they might not be prepared for! Now if you want to play something like this with cards from the upcoming expansion There Comes a Reckoning – think about what a card like Friends in High Places can do for Stephen! So all of these tricks aren’t enough for you? You want to know how to draw cards, gain ghost rock, and win elections? You want the toughest deck of the toughest decks? We have it. For card drawing there are few better options than Spirit Guidance to straight up get what you need. If you are playing people of the cheatin’ kind, a little insight might be better. You will always, however, need a steady Ghost Rock supply. Once all that is taken care of, make sure you have the right place for your home away from home. An old family estate works fine, or perhaps a hideout. Once you are settled in, make sure to secure it using the tricks from above – using spirit calling or just kicking dudes out of your home. Be sure to invite the right spirits in. With everything set up and your whole gang in your new home call in Nicodemus Whateley to finish it off. Saunter him into your fortress and commence voting. Be wary though! A kidnapping when Nic hits the table can be devastating – an Ambush even more so! I hope the spirits are with you and guide you on your journey through the Eagle Wardens faction. I have only touched upon a few of the deck possibilities out there and with cards like remedy and Fears No Owls the Warden’s powers continue to grow. Stand with us in our fight against evil or be craven and forgotten in the times to come.